Mark Smith watched the sun go down today over the frozen surface of the Mother Brook in Hyde Park. 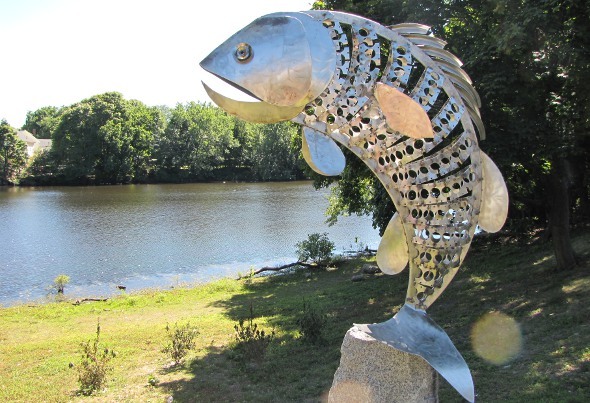 In 2012, Dedham sculptor Gints Grinbergs donated this statue, titled Largemouth Bass, to Dedham, which placed it on the banks of the Mother Brook, where Bussey intersects with Curve and Colburn. 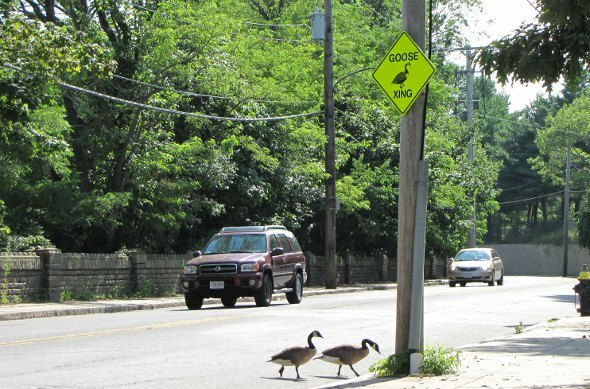 On River Street outbound from Cleary Square, just before Turtle Pond Parkway, there's this Goose Crossing sign. This afternoon, what seemed like endless squadrons of geese took full advantage of the sign, crossing from the Mother Brook to their ancestral grazing grounds on the large field across the street. A group approached the road, waited until it was clear in both directions and then waddled across. Cars stopped. Another gaggle of geese approached the road. The process repeated. Hey, who pulled the stopper out of the Mother Brook? There's probably a good reason why the "pond" off Sawmill Lane and Milton Street in Dedham has been allowed to dry up and become a giant field of mud with a rivulet meandering through it. Like maybe the state's planning to clean up all the shopping carts, scooters, computer monitors and other stuff that's been dumped there (anybody know?). Rob Villegas makes the case to do more to clean up and promote America's oldest canal, which starts at the Charles, flows under the Dedham Mall and reemerges on the other side of Washington Street to flow through a few picturesque stretches but also behind a lot of "grubby dilapidated buildings" and with a lot of stolen shopping cars in it before meeting up with the Neponset. Above: What used to be the Mother Brook, from the Hyde Park Avenue bridge. 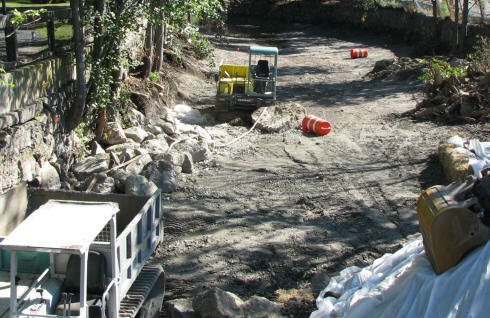 Anybody know why the Mother Brook in Hyde Park is being diverted into three pipes from the Shaw's to the Neponset River? General de-mucking and wall repair, or are they looking for something (Jimmy Hoffa's body)? 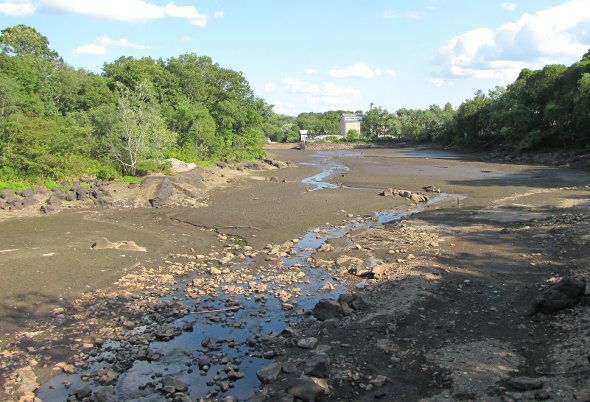 Bonus fun fact: The brook is the oldest canal in North America, built in 1639 to power mills in Dedham (although the manmade part only went from the Charles to a point just on the other side of what is now Washington Street, where it connected to a Neponset tributary called East Brook). 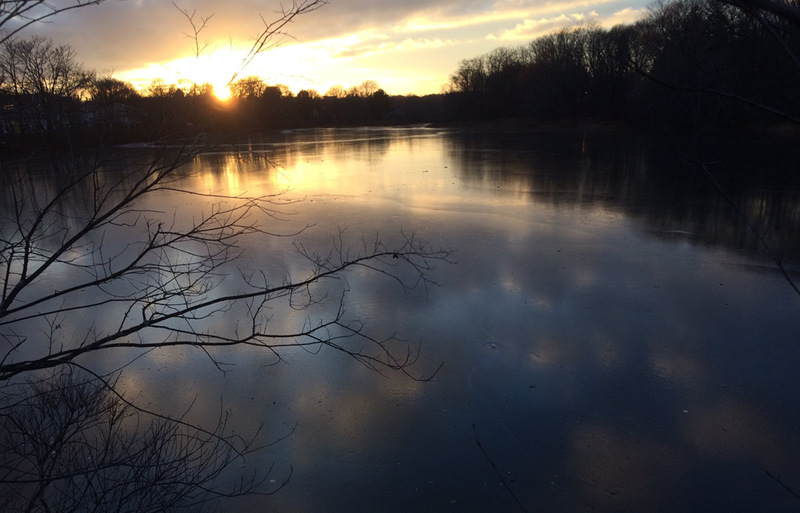 Dedham chimes in: Brian on myDedham wonders if Dedham should try to enforce the 170-year-old court decision under which at least up to one-third the Charles is supposed to be diverted into the brook; currently, it's only about a fourth. Apology: To anybody who remembers when that song managed to top the charts. The river part popped into my head when I saw the brook bottom and now I can't get it out of my head and misery loves company, right?